We’ve been following Novak Đoković in the Roland Garros Tennis Championship this week. We were so inspired that we went down to his tennis center. Oliver is shown above on the red clay of Belgrade. It is also the home of the Belgrade Open, one of the stops on the ATP tour. 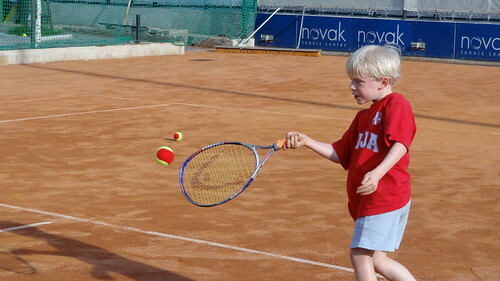 I really want to get the kids into tennis this summer. It is a great sport. It is something that Nadia and I can play together. It is so much better than golf in the fact that it is much quicker to play and it is more physical, although I do like the walking in “nature” aspect of golf. I am excited for the second week of the French Open. Let’s hope Novak can pull it out, although Nadal and Ferrer look like the favorites right now. It is very easy to live in Belgrade! Belgraders are very friendly and because there are so few tourists, foreigners are a curiosity and they want to know where you are from and show the best side of city to you. Most of the expats live in the neighborhoods of Senjak and Dedinje, which are two very upscale areas. Most Serbs live in small apartments. You can explore the archives of my blog to learn more – I can’t recommend Serbia enough, it is a great place to live!